Strato® processes all planimetric measurements or plano elevation performed by polygon, trilateration, leveling. In addition, corrects them for terrestrial sphericity, refraction or projection on a reference plane. For each station you can perform multiple layers of measures with automatic reduction to a single average reading. The compensation is rigorous with the method of least squares. In addition, the program allows you to store the history of processing multiple surveys for the subsequent numerical and graphical representation of the deviations plano altimetric. You can elaborate format cadastral surveys planimetric, plano altimetric, in rectangular coordinates. 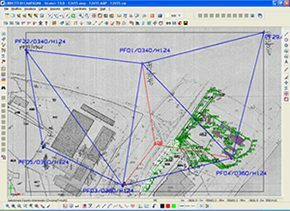 Strato® allows you, through rototranslation interactive or automatic, to orient or relocate the type of map in any reference system: in this way, if you use transparency in a raster image and/or vector, you can obtain the exact ovelapping of the drawings.